With the whir of electric wheels on rail, a black Great Northern engine, followed by a coal car, bright blue box car and caboose winds its way around miniature farm houses, a cafe with clients on the patio, and a train station with an impressive resemblance to the former Boston & Maine historic station in downtown Raymond, NH. It passes solar panels, colorful petals, an occasional lettuce head, and brightly tinted glass and porcelain flowers created from upcycled dishes. 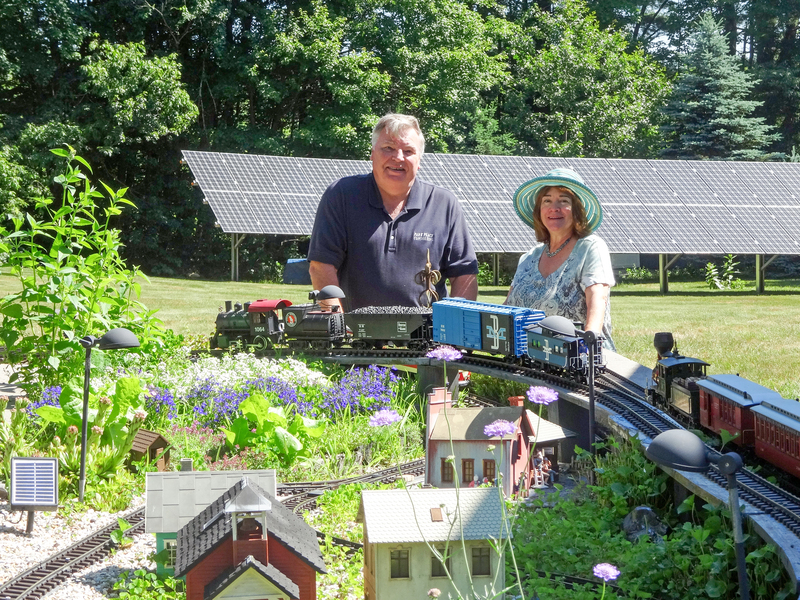 Bob & Kathy McDonald are both members of the NH Garden Railroad Society and like their Raymond home, their garden scale railroad also benefits from the power of the sun. While the solar railroad makes use of regular solar garden lights to illuminate the buildings along its path, in the background their ground-mounted photovoltaic array soaks up the sunshine of a clear summer day. The McDonald’s, who met at UNH Durham and married a few years after graduation, have lived in NH for over 30 years. Kathy is an artist and environmentalist who designs upcycled creations, turning trash into treasure, and Bob owns a commercial valuation and cost segregation consulting practice. They turned to solar for their home several years ago. For them, solar made financial sense. Through his consulting practice Bob has appraised many commercial and industrial properties, including solar energy farms, across the country. He says, “I’ve seen the total installed cost for solar go from $11 per watt, to about $5 per watt when we installed our own system (pre-tax credit), to now as low as $3 or less.” He also acknowledges that he’s seen many of his clients’ businesses move out of NH to states with lower electricity rates. Wanting to work with a local firm with a good reputation, they chose ReVision Energy out of several proposals to install the system – a 14.4kW array completed in October 2015. The array was designed to produce roughly 16,553 kWhs, and offset 15,177 lbs. of carbon pollution each year. In fact, they were so pleased with the investment, they decided to pursue high efficiency heating and cooling for their home as well. The air source heat pumps are especially beneficial for Bob’s mother’s house across the street, they explain. She was from Florida and chose a home design that also originated from the Sunshine State – with a propane heating system inefficiently located in the attic. The two new mini-split indoor units are installed on the first floor and in the basement which had never had heating prior. Now the basement heat pump works to heat and dehumidify, and if someone were to buy the house the McDonald’s say, it would add a lot of value – quite contrary to if they ever saw that propane bill! All in all, solar and heat pumps have paid off. The McDonald’s say their monthly electric costs are now in the $30 range as compared to average of $300 before the solar array. They’re able to monitor their system in real time with web based monitoring and report that the system has produced over 40,000 kilo-watt hours since the installation in 2015. Based on current electric rates, that’s a value of over $6,400. Having witnessed the power of electricity generated by the sun, both for their railroad and for their home, Kathy & Bob plan to continue their clean energy transition (perhaps with an electric vehicle!) They’re passionate about the systems that have made such a difference in their energy costs and hope to see more of their neighbors take up solar in the years to come!